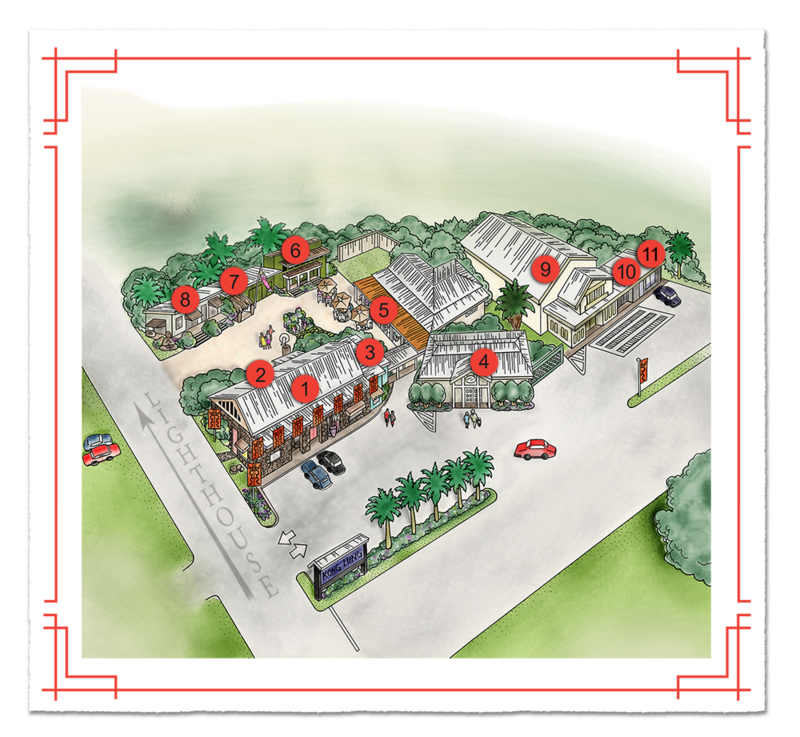 The historic stone Kong Lung plantation store is now home to Kong Lung Trading. Brett, WenYu and I wanted to go out for coffee and grab a treat following some lab work I had to take care of earlier this week, so after that was done we headed over to the nearby Kilauea Bakery & Pau Hana Pizza in the Kong Lung Market Center, located in Kilauea town on the north shore, on the way to the historic Kilauea Lighthouse. I got a latte, Brett had a cappuchino, and YaYu chose a homemade barbeque pork bao (Chinese steamed bun) a small cup of lilikoi lemonade. We also picked up a half-dozen coconut macaroons, WenYu’s favorite cookie. In 1902, the Kilauea Plantation rented one of their buildings to a Chinese businessman named Lung Wah Chee, who opened a store to supply merchandise and services to the plantation workers. The store not only carried a variety of merchandise, but also contained a barber shop, butcher shop, post office and even a diner. The original wood-framed building was replaced by a stone building in the 1940s, which is today occupied by the Kong Lung Trading gift store. The plantation stopped operating in 1970, but many of the buildings that were attached to it are now on the national historic register, including the Kong Lung Store stone building. 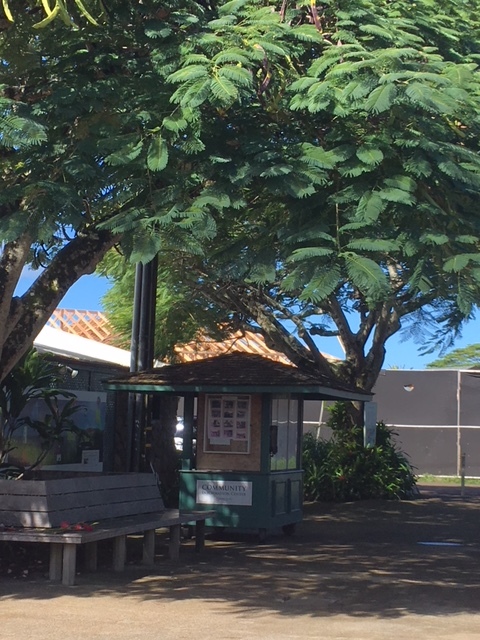 The Kilauea Bakery & Pau Hana Pizza has a large shaded lanai, perfect for dining al fresco. Several of the bakery’s selections are made with local produce, like breadfruit, lilikoi or coconut. Service at the bakery is quick and friendly no matter what you’re ordering. 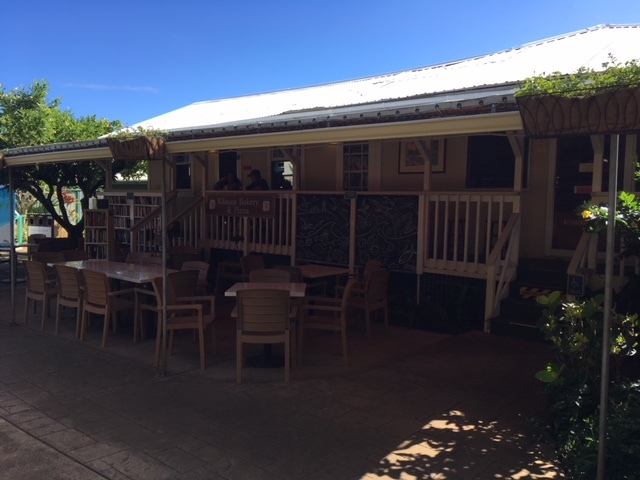 The Kilauea Bakery is located in a building behind the Lighthouse Bistro restaurant, which is easy to see in the front of the Center. 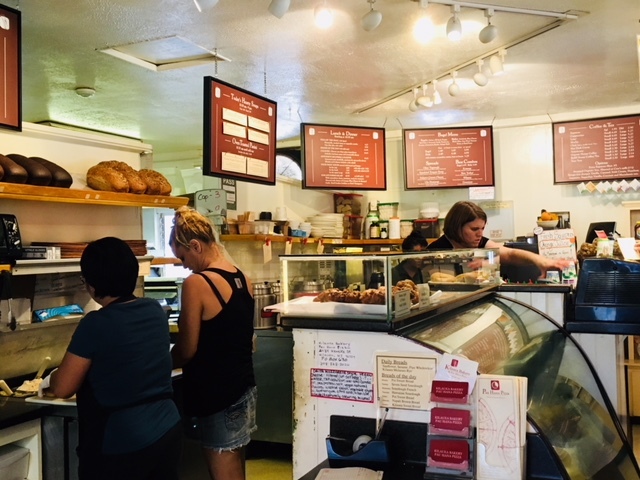 Along with terrific coffee drinks and bakery goods made with local ingredients, the Bakery sells wonderful soups and sandwiches and tasty pizza by the slice. There are a few tables for dining inside the bakery, but most people choose to sit outside on the lanai. 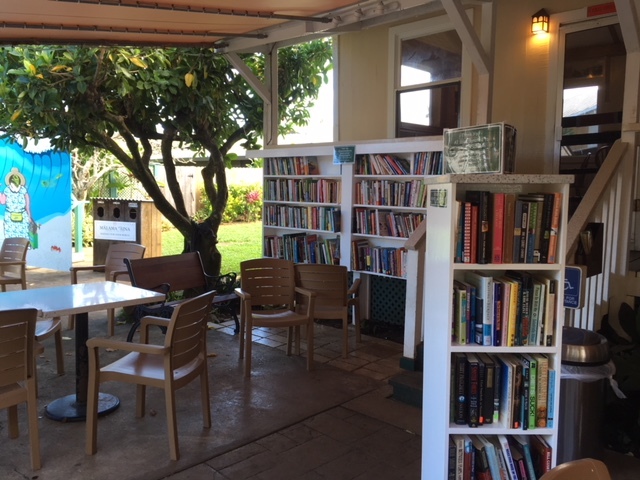 There’s a couple of large bookcases located out there – the books are donated by the community, and funds from their sale goes to the local public school’s literacy program (books are $2 each; children’s books are $1). Buying a book from the Bakery helps promote literacy at the local elementary school. 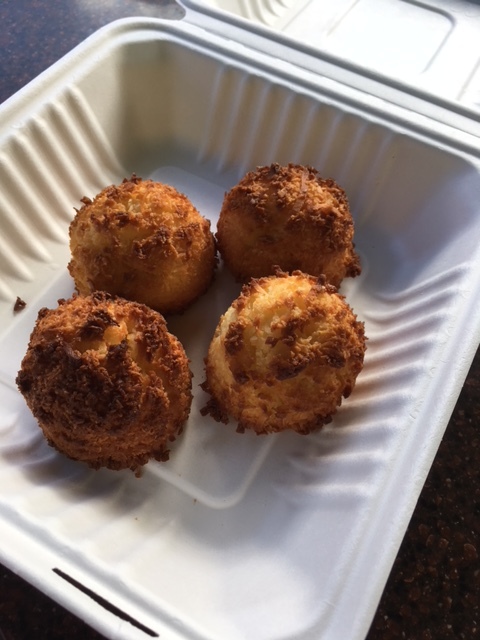 Kilauea Bakery’s big, tasty coconut macaroons are our favorite. Besides stopping at the bakery, we always like to check out what’s new at Kong Lung Trading as well. They have a wonderful assortment of gifts, toys and baby items, jewelry, clothing, books and other household decor. The shop is a fun place to look for a souvenir, and also one of the best places on the island to find a special gift. They also carry a great selection of cards for every occasion. Kong Lung Trading has a fun selection of items, from stuffed animals to cookbooks and everything in between. 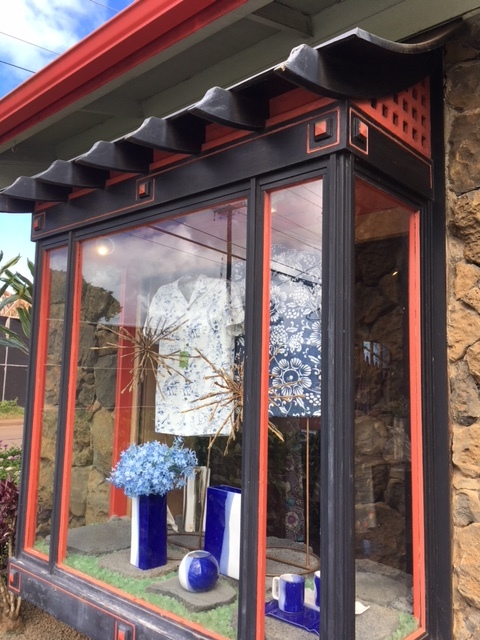 One of the plantation store’s original window has been updated, and now displays aloha shirts and gift items. 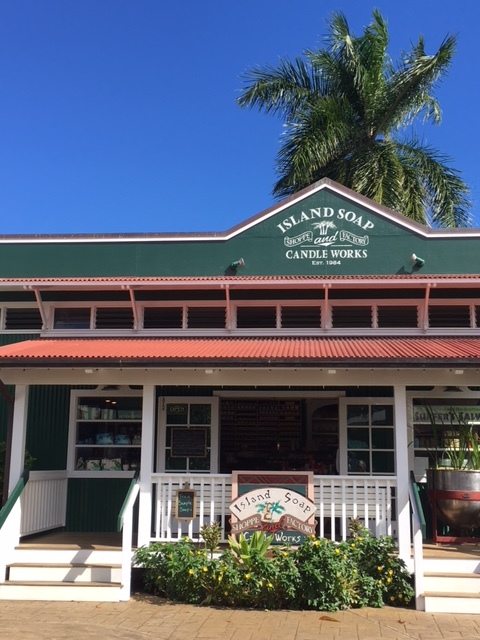 We usually also stop in the Island Soap & Candle Works when we visit the Market Center, but since we had just been in their Koloa store a couple of weeks earlier we didn’t go in this time. Soaps and candles are made on site, and come in a wide variety of scents. I am a huge fan of their lotions, especially the Hawaiian Sunrise scent (fresh orange), and also love their Relaxation Bar soap. 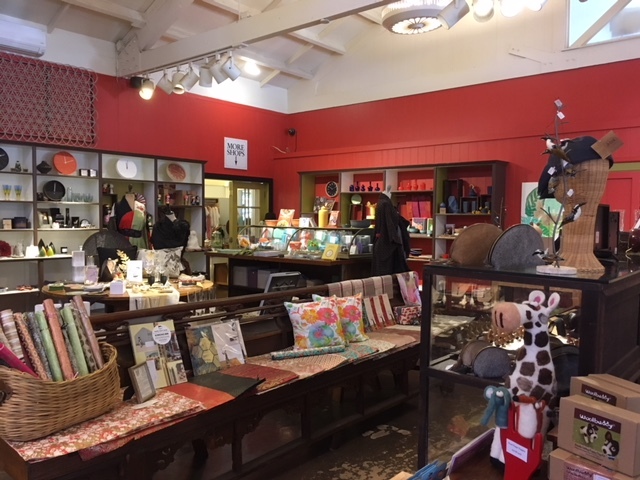 Located in a preserved historic building, the Island Soap & Candle Works has a large variety of locally made products. The entire Market Center invites browsing, either in one of the shops or outside in the courtyard while you enjoy a meal, snack or beverage. Visitors are welcome to take their time, and enjoy themselves. The Center also boasts an award-winning Historic Photo Retrospective located throughout the Center. The oversized photos illustrate life in Kilauea before, during, and after plantation days. If you desire shade, they have that too. The large poster on the tree is one of the photos in the Historic Photo Retrospective. 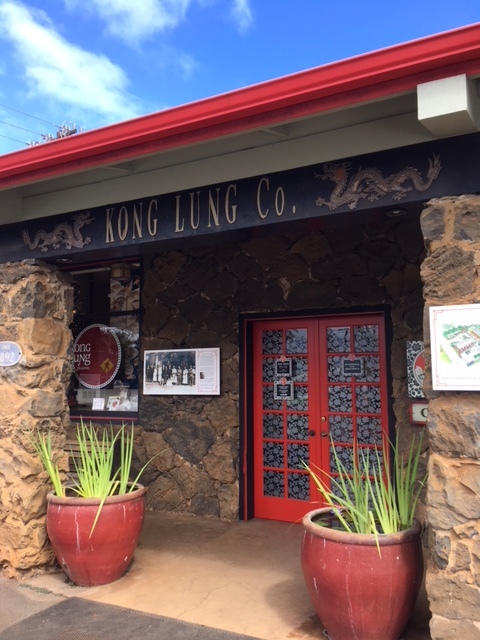 The Kong Lung Market Center is a great place to stop if you’re up on the north shore, or heading out to the Kilauea Lighthouse. 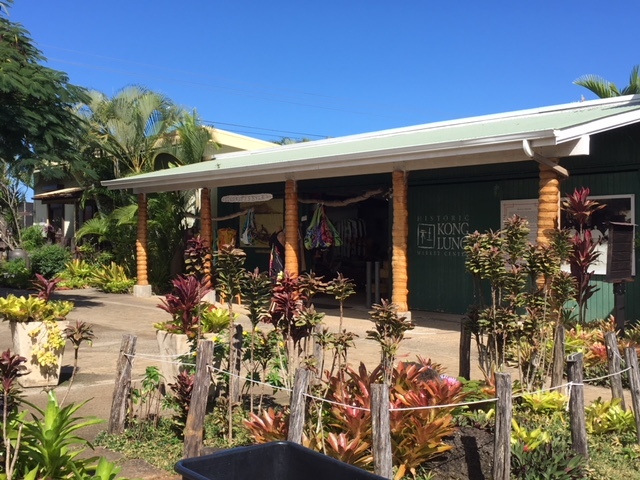 While you’re there you can grab a bite to eat or have a coffee and a snack, browse through the stores to pick up a gift or Kaua’i souvenir, or check out the photos to learn a little bit more about the history of Kilauea. Whatever your reason, the Market Center always invites visitors to put themselves on “Hawaii Time” and go a little slower. That bakery looks so yummy. And I love how they’ve paired buying a book with supporting the local elementary. The coconut macaroons. Oh my. We heard about the bakery the first time we visited and it did not disappoint! The macaroons are amazing. 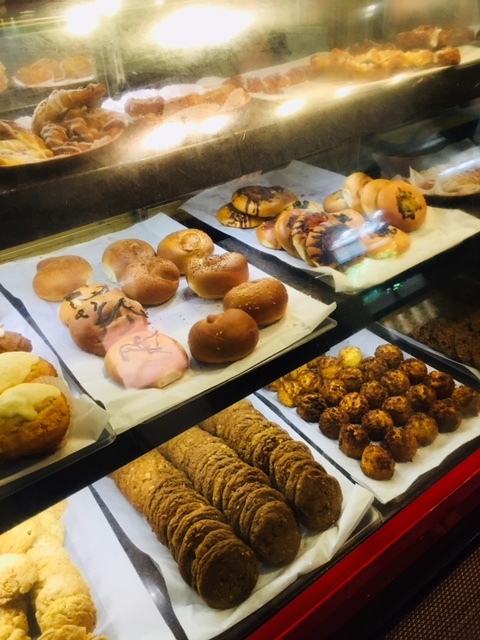 They supposedly sell (or did) an out-of-this world cherry kolache, but I’ve never seen them – I heard they sell/sold out within minutes after opening. I love the idea of the books supporting literacy at the school, and am always tempted to buy, but then remember I have a Kindle, and am on a buy-no-books diet. Does the island store sell online? I love anything orange and would love to order the lotion. Here is the link to the orange-scented lotion: http://www.islandsoap.com/products/hawaiian-sunrise-shea-butter-body-cream.html. It only comes in the one (small) size, but I like that it’s small enough to carry on when I travel. The scent is wonderful!